Follow the steps below to configure your GpsGate.com account for your Blackberry smartphone. 2.2 Important: the smartphone must have filled APN details in Options-Advanced Options-TCP. Check the correct settings with your network operator. 2.3 Important: the smartphone must be configured in Options-Security Options-TLS TLS Default as Handheld. Failing to satisfy 2.2 and 2.3 will reneder application to fail connecting to server with an "Open tunnel failure". 2.4 Start the application . 2.5 Select Settings in menu. 2.6 Fill your gpsgate server address. If you are using GPSGate.com service leave default. 2.7 If you have your own server installation, in other place than the domain root, fill the appropriate path. 2.8 Fill your gpsgate.com username and password. 2.10 Fill desired distance and select units. 2.11 Fill desired buffer pool size, where locations are kept in case transmission is not possible. Use 0 if you don't need positions buffering. 2.12 Select Save in menu. 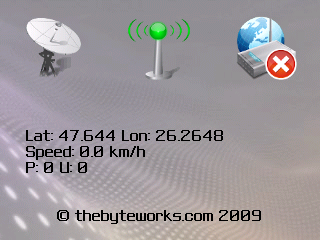 be transmitted as soon as conditions allow (network coverage).